You can trust your vehicle with us. Our certified and licensed technicians take pride in returning your vehicle back to its “Pre Collision” condition. The one difference you’ll definitely notice is the courteous, knowledgeable, and quick service that you will receive with us at Grandcity. That’s the reason why our customers love us! Grandcity’s state-of-the-art 10,000 sqft. facilities in Vancouver and Richmond include some of the most advanced autobody collision repair equipment available. This leading edge technology ensures we repair your vehicle as precisely and quickly as possible. We ensure that your car’s frame is set back its correct form and your vehicle is brought back to you in a “Pre Collision” condition. We make sure that your steering is calibrated correctly and that your wheels are aligned to their optimal driving position. Precise colour matching technology to guarantee that the paint we use in our repairs is an exact match each and every time. To get the best results, you must have the best equipment. Our spray booth is the “top of the line” and ensures the best paint application in the business. We value the environment and reflect these sustainable values in our use of green parts; our waste storage and recovery processes; our recycling of raw materials; our energy efficient shop, and our use of environmentally friendly paints. We value cleanliness and we keep our shop areas in top condition. We also adhere to strict guidelines to ensure that they meet and exceed safe worksite requirements. All of our technicians at Grandcity Autobody are fully certified and have at least 10 years of collision repair experience. We offer and encourage our technicians to take ongoing training in the latest collision industry procedures to ensure they have the highest level of expertise. Our technicians are experts in their field and they pride themselves in their workmanship and keen attention to detail. 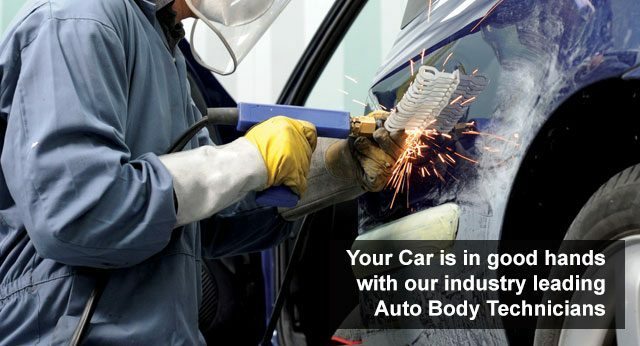 We are confident that they can repair your vehicle back to manufacturer’s specifications. You will not be disappointed!